If you’ve known me for longer than a minute, you’ll know I love to laugh. It goes to follow then that I’d love sitcoms. Hitting the top five of my all-time favs is the show “Mad About You” starring Paul Reiser and Helen Hunt. They play an adorable straight-forward couple learning how to live through what can seem like the endless mundane of everyday life. Only in the brilliance of TV Land…….they make it all seem so funny. This week I realized that that didn’t go unnoticed by the The Divine. The subject is close to my heart. 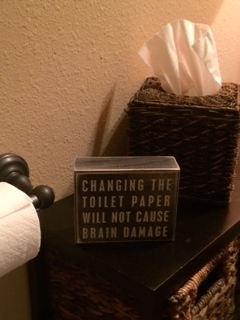 This plaque sits in our family bathroom. 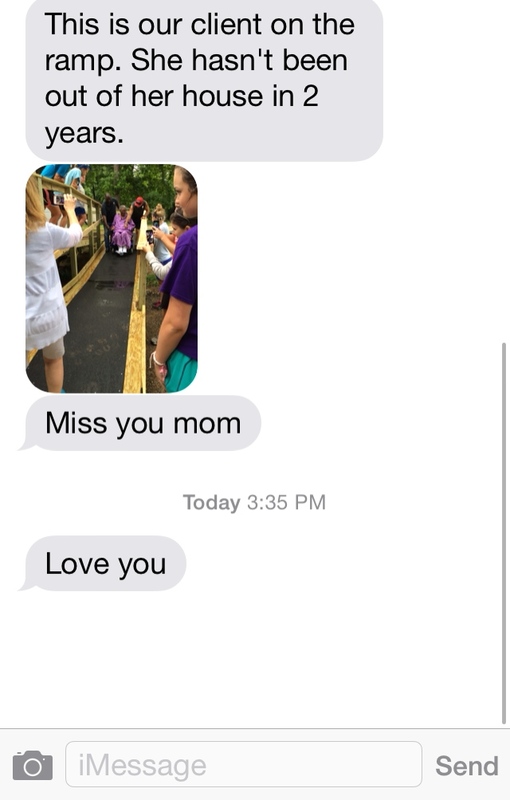 I have reiterated the point to death in the Page household……so I understand the frustration. Only this time it wasn’t funny……not at all. This time, I distinctly got the impression I wasn’t playing Helen’s character but Paul’s character on the couch and that God was doing the one doing the demonstration on how take care of the simple, mundane but necessary things in life. When the stung wore off I realized something else. Isn’t it just like God to use what we can appreciate to understand what His will is? After all, wasn’t that really the point of parables? He lets me know all the He loves me with an everlasting, unshakeable love. With that same love, He lets me know He’s not above using whatever it takes to help me learn to be obedient. He wants me to trust Him when it’s pleasant and He wants to trust Him when it’s not. Either way……I need to keep obediently changing the toliet paper roll. Did a little shopping this week. I’d like to be able to tell ya that I don’t get too worked about shopping……..but it’s not true. I love the excitement of finding a good deal. I’m a complete sucker for anything fun. And the thrill of the hunt can keep me in the game alllllll day, Baby. This one was pure genius on Coca Cola’s behalf. 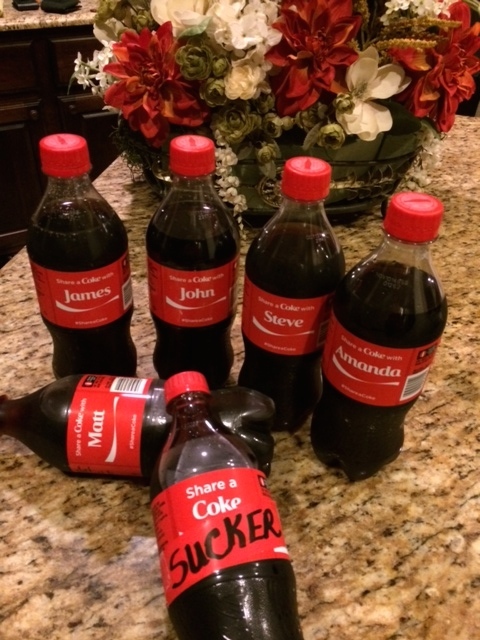 I worked hard to find all of my family’s names to share with them…………Nailed It. This got me to thinking just how often I may be guilty of looking for the next most exciting thing in other areas of my life. The next bestseller, the next big blockbuster, or dare I admit the next most awesomest bible study? Trusting is hard stuff for me. I realize now that it has a lot to do with just being okay to be still and wait on God. The enemy had me convinced that that would be boring. I wonder…just wonder how many amazing things I’ve missed by not cooperating fully with God. Seeking excitement instead of seeking His face. It’s not wrong to want to do great things for God……….It’s not wrong to enjoy shopping……..It’s not even wrong to write that letter to Coke complaining that they don’t print your name on their bottles. But it IS all about focus. I want to enjoy life but not get so caught up in the stuff that I forget He is my sole purpose for living, loving………. and sharing a Coke. I see you, and I am angry at what you have done. You cruelly hold hope from those that need it most by whispering unending doubt. You blind their eyes to the truth of God’s trustworthiness…… even as you question that His love is not enough to sustain them in their circumstance. You torment them that devastation is upon them until anxiety starts to feel like their new normal. You unfairly demand guarantees that cannot be given if they are ever to learn to walk by faith. In this way, you try to steal their future to become all that they were meant to be. Also, you are a coward. You hide in places that cannot be seen and use the shards of brokenness to rip away peace until all that is left is does not appear beautiful or worth it. I have honestly never felt more helpless with you at the wheel in the lives of the people I love, or more insecure with you running rampant in the world in which I live. You puff yourself up to intimidate and torment their thoughts..…..with no other agenda than to hold them back from reaching for grace. If Jesus were here……..you wouldn’t get away with it. If Jesus were here……..He’d put you in your place. If Jesus were here……..He’d speak Peace and send you screaming back to the pit you’ve dug for them. If Jesus were here……..He’d reassure them that miracles can be trusted because they come from the heart of The Father. In His Kingdom miracles are normal……brokenness isn’t. If Jesus were here…….His presence alone would carry healing for the mental anguish you’ve wrought and the dis-ease it’s brought to the body. ……Wait, hang on. Did you hear something? Hold that thought Fear…….. I thought I heard knocking. Why, yes…. Someone’s knocking on the door of my heart. Though you’d never know it by the Vacant Bored Stares and Violently Breathed Sighs of my children, It’s been a Vibrant, Bustling Summer already. Why just this week alone, I’ve had a Very Busy Schedule. So much so……. that by the end of today, It’s quite possible I’ll have forgotten my name and need assistance to my car. The doc says it’s called Vortex Brain Syndrome. But, with plenty of rest and a Vitamin B Script …… I should be Vastly Better Soon. Though he’s not completely sure what has caused it, I wouldn’t read anything into it. Sometimes, the mind just gets caught up Visualizing Better Stuff and can’t be bothered to pull away for the more mundane tasks of life. It’ll be fine, I’m sure. The one thing I know that I know…….Even when it all goes wrong, Jesus loves me! There’s a message in there somewhere…….we think. Hopefully Friday’s writer will get her act together Very Bloomin’ Soon! If you’ve known me longer than a minute, you’ll know I want Jesus for my kids. Seriously, want them to know Him and be known by Him more than anything else on earth. More than security, more than blessing, more than health or wealth or even family. More than any other great “thing” I could pray over them. That’s because I deeply understand that every good thing is found in Him. He is truly all they will ever need. 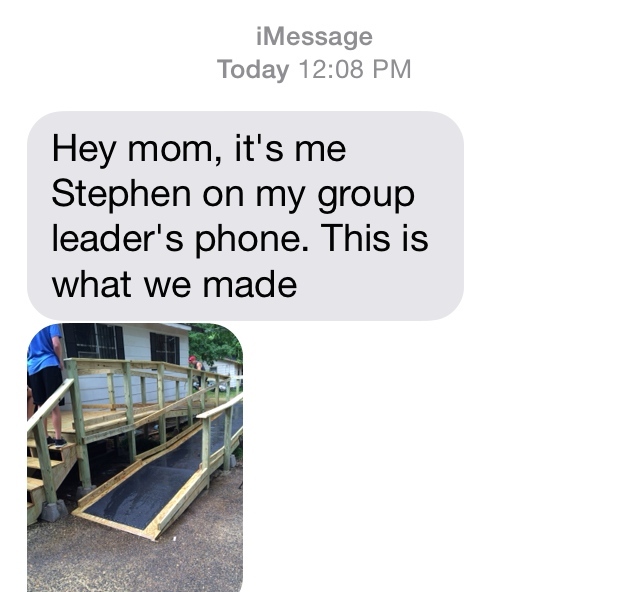 So, when I got this text my reaction was two-fold…….Super proud that Stephen was giving of himself, and so humbly grateful that God had made this opportunity to come close in Stephen’s life via this precious lady “client”. What a gift! I don’t know about you, but I am highly anticipating Sunday and the return of our “Army”. I want to hug their necks and hear their stories. I want to join them in worship and be deepened in faith by their testimonies. And I want to thank them for answering the call to be UM AWESOME! I hope you’ll join me……. April, my saint of a fitness trainer, is transitioning me to group classes soon. Don’t freak….I still have her on speed-dial. But the truth is, I’m much stronger than I was 6 months ago. It’s time to grow to the next level. She knows it and I know it. The courage it will take to do this is now more mental than physical. We were working out this past week and I was struggling. We’d been strength training for awhile but that day had gone back to doing cardio intervals (which I, myself, do not particularly like, thank you very much). She was super proud of this new app on her phone that timed the reps. I wasn’t buying into the excitement. I just wanted them to be over with. I was so focused on how uncomfortable I was and how much I didn’t like them……I was fearful of the pain and frustrated at the work. Strangely, I wasn’t conscious of any of it till April said something to me that has haunted me for the remainder of the week. In the moment I couldn’t breathe, and I was angry….but I was also listening. Right there, I determined instead of wishing my way through it, I was going to focus on holding that squat no matter what. Every muscle in my legs began to violently shake. But I held it. I felt like I was going to break from the intense burning. But I held it. It hurt so bad that I didn’t know I even possessed the ability to endure it….until I did…I held it. When it was over, I collapsed on the floor and gasped for air. But from deep inside me came this intense sense of pride and I was awash with fresh gratitude to April for both understanding what I was capable of and pushing me to reach for it. It hit me then: the only change I had made in the moment was mental. In that moment, I couldn’t breathe, and I was very angry.…but I was also listening. Instantly, I flashed back to the gym. (No, not the moment of desperately gutting it out.) But the moment that came after…when I was proud of myself, left without regret, and so grateful that the person guiding me was both trustworthy and had my best interest at heart. I remembered, the only change I had to make in that moment was mental. So I closed my eyes, unclenched my fists and confessed through tears that it hurt…I said that if He were willing to help me, I was willing to let it go. The hardest part at that point was to deliberately NOT dwell on it. Not in those moments, nor the days that followed. Instead, I let myself be proud that I had chosen forgiveness (despite my feelings). I thought about the fact that I didn’t give place nor foothold to the enemy to use against me at some later date. And as the week progressed, I found myself becoming overwhelmingly grateful that God had pushed me to do so because He knew I was capable of it. It wasn’t easy. But no one is ever really proud of “easy”. We are most awed and amazed when we reach past “easy” to that which we were never really sure we were capable of…until we hold it. My Friend, I want you to know: I understand. There may be some things happening to you right now that are hurting you. Maybe you find yourself just wishing it’d all pass you by and let you be. Maybe you even feel a bit picked on, pressured and angry about it. Or completely incapable of bearing up under it. If any part of it helps you to stop being fearful of the pain or frustrated by the work…….Then it’s been a great week of growth for us both. Later this evening, I’ll light you some candles………roman style. Sorry……apparently I needed to have paid for the rights to that little privilege. Why is it the good stuff is never free? Oh, they’ll tell you it is…….but it’s not. There is a price (or sacrifice made) for anything worth having. Viv’s blog on Wed reminded me that our country’s freedom is one of those worthwhile things. Those are just a few of the verses that speak to the importance of being free. But free to do what exactly? I’m sure the answers to that are as varied as the choices you had at the fireworks stand this week. Did you get the “buy one get 11 free special”? Truth is, Jesus didn’t lay down his life for cheap thrills……..The kind of freedom He died for us to have is the freedom to do the hard stuff with grace. We aren’t free to sin…….we are free to not have to. Free to choose. God goes to great lengths to protect our right to choose to serve Him or self. There is proof of Himself in abundance for those who want to believe. There are doorways of doubt for those who just want a way out. Free to love. We can love the unlovely because we’ve been given love to give away. It’s a choice, not a feeling. It’s powerful. Free to be made whole. If you are someone whose ever suffered from an addiction, you will readily understand the value of such freedom. It is precious. To have the power to walk away from something or someone that used to have great power over you is priceless treasure. Free to hope. When you begin to trust God that your future with Him is secure. The enemy can’t hold you with insecurity. Free to worship. We can always choose words that glorify God. He has promised to put a new song within us. Praising God is something our spirits crave to do. Free to give. Maybe you don’t “feel” like you have a whole lot of anything of value. But be willing to open your hand to the Holy Spirit with what you do have. He will do amazing things. Consider all the freedoms you have. Can you think of others? As you celebrate this day, offer thanks to the One who made them possible. Send a roman candle His way…….I plan to.